Let's start with a few confusing sentences this week. You plant spring flowering bulbs in the fall and summer flowering bulbs in the spring. You dig up summer bulbs in the fall. You divide spring bulbs in late summer. Your favorite spring bulbs are winter hardy and for them to bloom in the spring they need to have the cold soil temperatures to trigger them to sprout and bloom in the spring. There are many kinds of spring bulbs, such as those that bloom as the snow is retreating and other spring bulbs that will bloom much later. Proper planning can provide several weeks of spring bloom. As you plan there are early spring bulbs that do very well in partial shade and those later spring bulbs that do best in full sun for the best effect. Those early spring flowering bulbs typically are much smaller in size along with their bloom too. This goes towards proper planting as well. 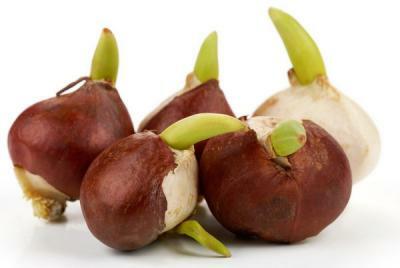 Bulbs are planted 2 to 3 times their diameter in the soil profile. While you can plant those larger bulbs more shallow, the bulbs should be deeper for a permanent planting. If your spring bulbs need dividing because of being overcrowded that should be done in the late summer, after the foliage has naturally died down. You may even have to mark the area with a garden stake to find them later. Summer bulbs, which are not winter hardy, will need to be dug up just before a killing frost or immediately after. Mark your calendar accordingly. In a lot of cases, it is easier to dig them up before the frost has killed the foliage, especially those summer bulbs/roots/tubers/etc. that have lots of moisture in the foliage; it can get pretty messy like mushy canna stalks! Once the summer flowering bulbs have been dug, they will need to cure and dry down before you can store them in a safe place for the winter. They need above freezing temperatures yet not too warm or those summer bulbs will want to grow. Summer bulbs do not require a cold treatment; they are just "resting" until you plant them back outdoors or bring them into warmer temperatures to give them a head start for your flower garden. Just like starting vegetable seeds for transplants, do not start too early or your summer bulbs will be ready for outdoors long before the temperatures favor their growth outside. There are dozens of spring bulbs on the market ready for fall planting right now. By family name consider the alliums, fritillaries, Hyacinthus, tulips and daffodils as examples. There are many more, so use the next few weeks to shop locally or from specialty catalogues to ensure a great bloom period. You will have all winter to plan where those summer bulbs will go. Bloom times will be broken down and listed as early spring, spring, summer, and mid- to late summer to fall. Keep in mind, in northern Illinois, these seasons run together, while farther south in the state they are more separated. Locations can be broken down into partial shade (has at least 4 hours of sun), shade (having less than 2 hours of sunlight) and sun (having less than 2 hours of shade during the day). Don't worry, there should still plenty of time to get that spring bloom show in the ground, right up until the ground gets frosty and frozen.